City in La Rioja, in the diocese of Calahorra, Spain. In the fifteenth century it contained a Jewish community, the members of which were engaged in agricultural, commercial, and industrial pursuits, particularly in tanning, and lived in the De la Mota quarter. 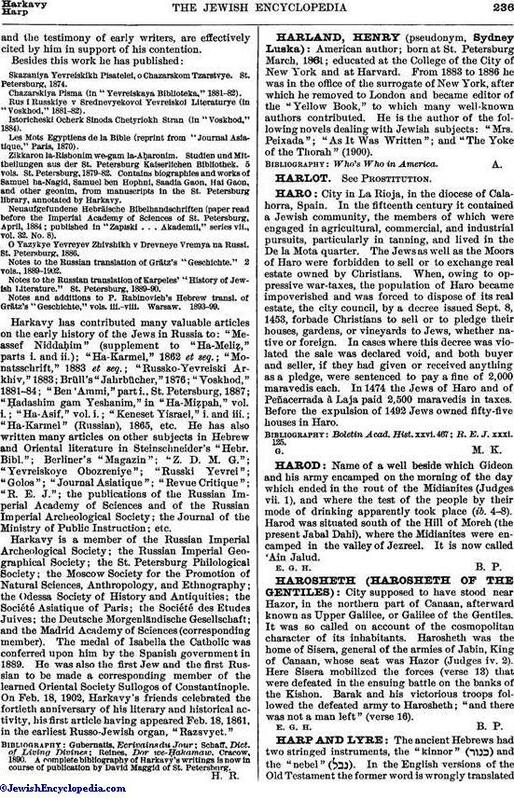 The Jews as well as the Moors of Haro were forbidden to sell or to exchange real estate owned by Christians. When, owing to oppressive war-taxes, the population of Haro became impoverished and was forced to dispose of its real estate, the city council, by a decree issued Sept. 8, 1453, forbade Christians to sell or to pledge their houses, gardens, or vineyards to Jews, whether native or foreign. In cases where this decree was violated the sale was declared void, and both buyer and seller, if they had given or received anything as a pledge, were sentenced to pay a fine of 2,000 maravedis each. In 1474 the Jews of Haro and of Peñacerrada à Laja paid 2,500 maravedis in taxes. Before the expulsion of 1492 Jews owned fifty-five houses in Haro. R. E. J. xxxi. 125.